Memorial cruise re-creates Titanic voyage, minus iceberg, Cruise re-creates Titanic trip, Is it tempting fate to sail to the spot where the Titanic sank, on the 100th anniversary of the tragedy, taking the same trajectory and the same number of passengers, including relatives of the 1,500 people who died? 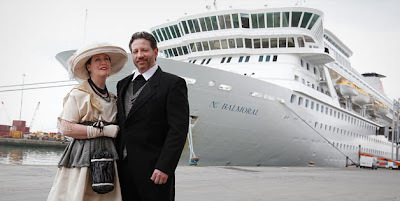 Maybe, but the Balmoral's Titanic Memorial Cruise is proving awfully tempting to history buffs anyway, as the journey retraces the Titanic's voyage, with a special memorial service planned. Tickets went for $4,500-9,500 and Titanic fans from 28 countries are onboard -- some in period-correct Edwardian dress. Cool though it sounds, we'd prefer a safer course, like enjoying the opulent last meal from the Titanic's only voyage -- even if that single meal costs up to twice as much as a ticket for the entire 12-night cruise.